The what? That's right - Alabama has a wine trail. Who knew?! We didn't know anything about it until a few weeks ago. Our waiter at Wine Down Wednesday mentioned it to us and we were very intrigued. I searched the internets and found out that there are 3 wineries close to our house. I wanted to check them all out. Foodbuzz has a monthly feature called 24, 24, 24 - 24 meals, 24 hours, 24 blogs. I submitted my wine trail idea and they accepted it! We hit the trail early Saturday morning. We started at Morgan Creek Vineyards in Harpersville, AL. Morgan Creek is the largest winery in the state. They produce approximately 15,000 cases of wine per year. Not bad for what started out as just a hobby! Morgan Creek offers free tastings of all their wines. Their most popular wine is muscadine. They also produce a nice blueberry wine and, our favorite, a peach wine. We bought a bottle of their Grape Seed Oil and some Italian seasonings to dip bread in for dinner Saturday night. It was fantastic! It was worth the trip just for the grape seed oil - it is a must buy! Our next stop on the trail was Vizzini Farms Winery in Calera, AL. 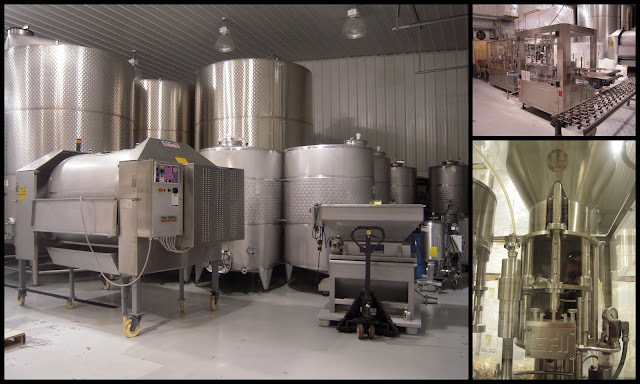 Vizzini is the second largest winery in the state and makes 12 different wines. We chose this as our second stop because they serve lunch. 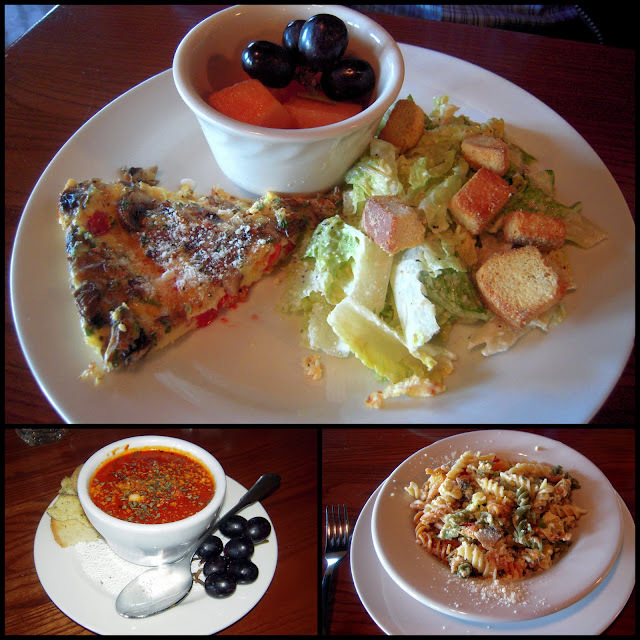 Tadd had the frittata with caesar salad and I had a cup of tomato basil soup and the carbonara . After we ate, we tasted the wine! Vizzini had a great variety of wine. They had more traditional wines - Chardonnay, Pinot Noir, etc. Our favorite wine was the Apple Riesling - they make the wine with Washington state apples. It was great; it had a nice crispness and wasn't overly sweet. Our final stop on the trail was the Ozan Winery in Calera, AL. The winery is located next to the Heart of Dixie railroad. Starting in April, they have a wine train lunch that includes sampling of all their wines, a souvenir glass, boxed lunch and train excursion. Ozan grows a native grape, the Red Norton grape, on-site at the winery. Their most popular wine is their Chilton County Peach wine. We enjoyed three complimentary samples. We chose to sample the Peach, Norton and the Shelby Blanc. We bought a bottle of peach wine so we could make their peach wine cake for dessert. The cake was so easy to make - it is a doctored up cake mix - and it tasted fabulous!! We each had a piece with some vanilla ice cream. I can't wait to have another piece today! Combine mix and gelatin. Add eggs, oil and wine. Mix well and set aside. Prepare tube pan and sprinkle half of pecans in bottom. Add batter and bake at 350 degrees for 40 to 42 minutes. Combine sugar, butter and wine and bring to a boil. Cool cake for 10 minutes. Pour half of glaze on cake. Wait 30 minutes. Pour remaining glaze on cake and sprinkle with pecans. Thanks for the link - that BBQ Trail looks like fun!! We are going to check a few of these out! I didn't know Alabama had wineries. I just asked my honey if he knew it did. That's wonderful that you got to visit them on Foodbuzz's dime. I need to check out some of the Tennessee wineries too, there's one just a few miles from us and I've never been there. This Peach Wine Cake sounds the best! I also love creme brulee french toast from your previous post! I'm saving both of these and trying them soon! Have a wonderful week Steph! I have lived in Alabama all of my life and had no idea we had wineries here. Thank you so much for sharing. Can't wait to check them out! Since I live in Alabama...I think I might need to check this out! Great to find a fellow Alabama food blogger. Have you ever gotten up to New England and in particular New Hampshire? We have a several wine trails that people are surprised to hear about as well. With a lot of local fruit available in addition to locally grown grapes, the wines come in many different styles and are quite enjoyable. Enjoyable wine tour article, but to update your information of what is available in Alabama, do yourself a favor and travel to Anniston, AL and visit White Oaks Vineyards. Some remarkable wines from some really nice folks. White Oaks "Burgundy" (Norton grape) is a value Norton wine which compares well to Arkansas' Mount Bethel Cynthiana (Norton) wine, Century Farms Norton in Tennessee, and Georgia's Three Sister's Norton wines. White Oaks is in a neat setting of native wild azaleas. A nice cross section of available wines.